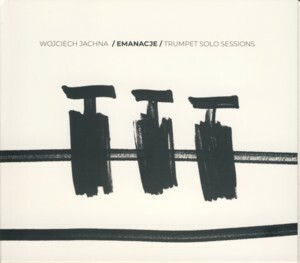 This is a solo trumpet album by Polish Jazz trumpeter / composer Wojciech JachnaFind albums by this artist. The album examines the relationship between sound and space and was recorded in several locations around Jachna´s home town of Bydgoszcz, like the Synagogue and the Water Tower, and other locations with a specific architectural design, which influences the acoustics. The album presents fourteen relatively short improvisations on themes, mostly composed by Jachna (eight tracks). Guitarist Jakub ZiolekFind albums by this artist guests on one track, which was composed by Ornette ColemanFind albums by this artist. For several years now Jachna has been consistently paving his way towards the top of the Polish Improvised Music / Jazz trumpet scene, obviously influenced by the two major / celebrated Polish Jazz trumpet figures, sadly both not with us any more: his hometown hero Andrzej PrzybielskiFind albums by this artist and of course Tomasz StankoFind albums by this artist. It is not surprising therefore that a composition by each of these two great musicians is present next to each other on the album. Also present is a composition by the godfather of Polish Jazz, Krzysztof KomedaFind albums by this artist. As a result Jachna seems to pay tribute to the Masters, recognizing their influence, along with his own contributions, which mark his own path. The music was recorded three years before the album´s release, which means that Jachna released several albums after this music was recorded, allowing us a glimpse into the past. The sound of the trumpet reflected by the acoustics of the various architectural structures is a lonely journey, minimalist and introvert, but full of emotion and beauty, which should keep all Improvised Music enthusiasts perfectly happy. Jachna has a rare talent to express his emotions and musical ideas clearly and effectively, which is even more powerful in the solo setting. This album is a document of an experiment, which proves that Jachna is at all times searching for new ways to express his music. Overall this is an unusual and interesting album, which is definitely worth investigating by Polish Jazz, Improvised Music and trumpet connoisseurs the world over.